I came across the ‘Madonna in the Rose Garden’ quite by accident. And what a lucky accident it was. She is to be found in ‘La Petite Venise’ – in Colmar, Alsace. Schongauer, the engraver and painter responsible for this spectacular piece of Art, was in his day probably the most famous artist in Germany; it was in his workshop that the young Dürer hoped to study, but when he arrived in Colmar in 1492 the master had recently died. Only one painting certainly by Schongauer survives – this one! His work was strongly influenced by Flemish art but Schongauer also had a powerful imagination of his own. He concentrated on religious subjects and about 115 plates by him are known. I particularly love this piece and indeed could hardly get away from it. Throughout our stay in Colmar I kept going back to visit my lady in the Rose Garden. What struck me deeply, besides the engrossment with line, also found in his pen drawings, was the choice of colour – often the Madonna colours are a soft blue and a cream or a porcelain white – but here, Schongauer boldy chose a vibrant red for both cloak and robe. He combines monumentality with tenderness and compassion. 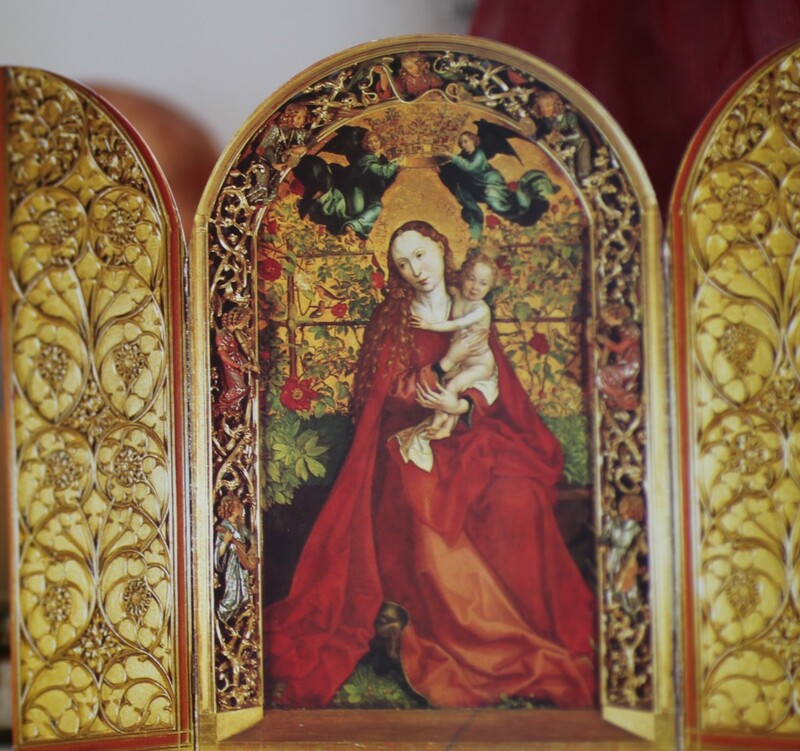 She now adorns the bookshelf in my studio, no longer a full-size altarpiece but in the form of a little pop-up card. I appreciate her wonderful presence nonetheless. le fantastique grande travaux !